[158 Pages Report] The increasing demand for safety light curtains is owing to their wide use in various industries such as automotive, food & beverages, and healthcare. Safety light curtains help in ensuring the safety of workers working on machines carrying out activities such as pressing, cutting, and welding, among others. The major factors the growth of the safety light curtain market include the increasing incidents of accidents in industries; rise in industrial revolution 4.0; and rising need for safety light curtains in the packaging industry powered by robotics; among others. The safety light curtain market was valued at USD 865.5 Million in 2016 and is expected to grow at a CAGR of 4.4% between 2017 and 2023. The base year considered for the study is 2016, and the forecast period is between 2017 and 2023. The objective of the report is to provide a detailed analysis of the safety light curtain market on the basis of safety level, component, resolution, industry, and geography. The report provides detailed information regarding the major factors influencing the growth of the safety light curtain market. The research methodology used to estimate and forecast the safety light curtain market begins with capturing data on the revenue of key vendors through secondary research via sources such as International Safety Equipment Association and International Institute of Industrial Safety Management. The vendors’ offerings have also been taken into consideration to determine market segments. The bottom-up procedure has been employed to arrive at the overall size of the safety light curtain market from the revenue of key players. 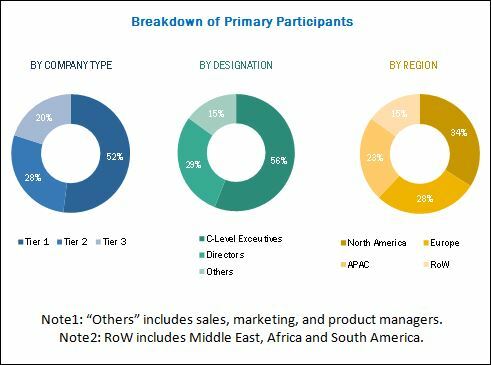 After arriving at the overall market size, the total market has been split into several segments and subsegments that have been verified through primary research by conducting extensive interviews with key experts such as CEOs, VPs, directors, and executives. The market breakdown and data triangulation procedures have been employed to complete the overall market engineering process and arrive at the exact statistics for all the segments and subsegments. The breakdown of the profiles of primaries has been depicted in the following figure. The major players involved in the development of safety light curtains include Omron (Japan), KEYENCE (Japan), Rockwell Automation (US), SICK (Germany), Pepperl+Fuchs (Germany). The safety light curtains provided by these players are required to meet the standards mandated by governmental organizations such as OSHA and ISO. This research report categorizes the safety light curtain market on the basis of safety level, component, resolution, industry, and geography. 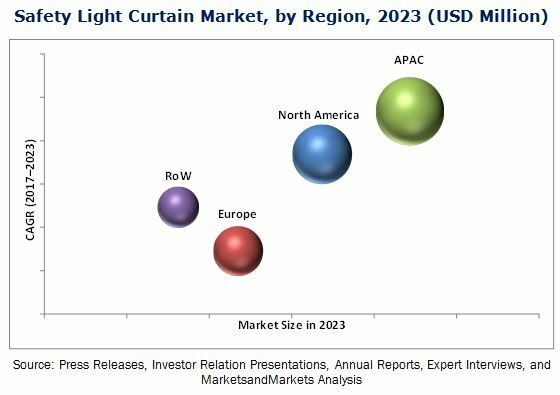 The safety light curtain market is expected to be worth USD 1,178.2 Million by 2023, growing at a CAGR of 4.4% between 2017 and 2023. The growth of this market can be attributed to the increasing incidents of accidents in industries; rise in industrial revolution 4.0; and rising need for safety light curtains in the packaging industry powered by robotics. The market for type 4 safety light curtains is expected to grow a high rate between 2017 and 2023. The applications of the type 4 safety light curtains are determined on the basis of risk assessment; areas wherein risks are moderate or high, type 4 safety light curtains are recommended. The risk assessment is done by determining the severity of the damage or injury and the probability of its occurrence. The severity of damages may differ from one country to another based on their respective rules and regulations. The market for control units is expected to grow at a high rate between 2017 and 2023. The control unit in a safety light curtain controls the actions of infrared light transmitting LEDs and infrared light receiving photoelectric cells and sends out signals according to the events. In case the control unit detects an internal fault in any component, such as LEDs or photoelectric cells, of a safety light curtain, the curtain undergoes a lockout condition. The market for 25–90mm safety light curtains is expected to grow at a high rate between 2017 and 2023. The resolution range of 25mm to 90mm has been further divided into two ranges: 25–49mm and 50–90mm. The safety light curtains with a resolution ranging from 25mm to 49mm are widely used for hand detection applications. 50–90mm safety light curtains are deployed where robotic machines are used; these safety light curtains help in keeping robotic arms safe in confined areas; in case there is any breach of the curtains, internally or externally, the arms are notified, and necessary emergency protocols are followed to safeguard the operators and the machines. The safety light curtain market for the automotive industry is expected to grow at a high rate between 2017 and 2023. Automotive is one of the largest industries in the world and plays a major role in supporting the economies of various countries. Automobile manufacturing plants comprise heavy machinery, precision equipment, and a number of complicated processes; high automation is thus required while manufacturing an automobile. Owing to the involvement of automated machinery and workers working around these machines, the necessity of safety light curtain arises. Safety light curtains are widely used in the automotive industry for a number of applications at various points of operations. Conveyor machines, robotic arms, welding machines, and press machines are a few man-machine systems used in automobile manufacturing plants. The installation of these systems is usually followed by the implementation of proper safety standards, equipment, and control systems. APAC is expected to hold the largest share of the safety light curtain market by 2023. APAC comprises countries such as China, Japan, India, and South Korea. China is among the fastest-growing economies in APAC, and also is one of the biggest manufacturing hubs in the region. China specializes in the mass production of almost every product catering to industries such as automotive, semiconductor, electronics, chemicals, food & beverages, and healthcare, followed by India, which is also a major economy in APAC. Japan is a smaller country with respect to land size, but is responsible for huge production output and energy consumption. South Korea has vast automotive and semiconductor manufacturing industries. These factors are driving the growth of the safety light curtain market in APAC. Major factors restraining the growth of the safety light curtain market include the inability of safety light curtains to protect from secondary hazards such as debris and spark; and the need for regular maintenance of safety light curtains. Key market players such as Omron (Japan), KEYENCE (Japan), SICK (Germany), Rockwell Automation (US), and Pepperl+Fuchs (Germany) are focusing on the strategies such as product launches to gain a competitive edge in the safety light curtain market and expand their distribution networks. *Details on Products Offered, Strength of Product Portfolio, Business Strategy Excellence and Recent Developments Might Not Be Captured in Case of Unlisted Companies.